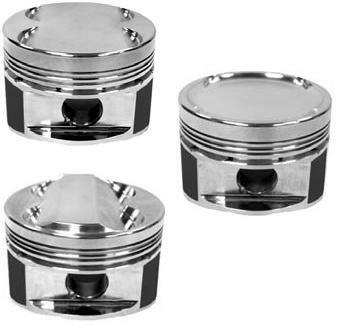 Manley pistons are machined of high strength 2618 material. Each design is lightweight yet robust enough to deliver long service life. Perfect ring groove to skirt squareness is achieved through our unique “one fixturing” manufacturing method that assures maximum horsepower. Round wire locks, tool steel wrist pins, and rings are included with every set at no additional charge. 2618 alloy for maximum high temperature strength and fatigue resistance. “Contour forgings” provide the optimum balance between strength and weight with no grain-interrupting internal milling. Proprietary multi-step top ring groove machining process assures optimum control of the groove’s size, geometry, flatness, and finish. All final turning is performed in one fixturing resulting in complete squareness of rings to the cylinder wall. Federal Form-Scan gauging validates ideal skirt indexing to pinhole and skirt-to-skirt polarity. Value – added features such as a pressure balance groove included in all series. Precise pinhole machining results in an exact compression distance as well as precise lock ring groove spacing, size, and concentricity.